Enbridge’s current deteriorating Line 3 tar sands crude oil pipeline on the Fond du Lac Reservation. Erosion and other factors have exposed the pipeline above ground (2016). Photos by John Ratzloff. 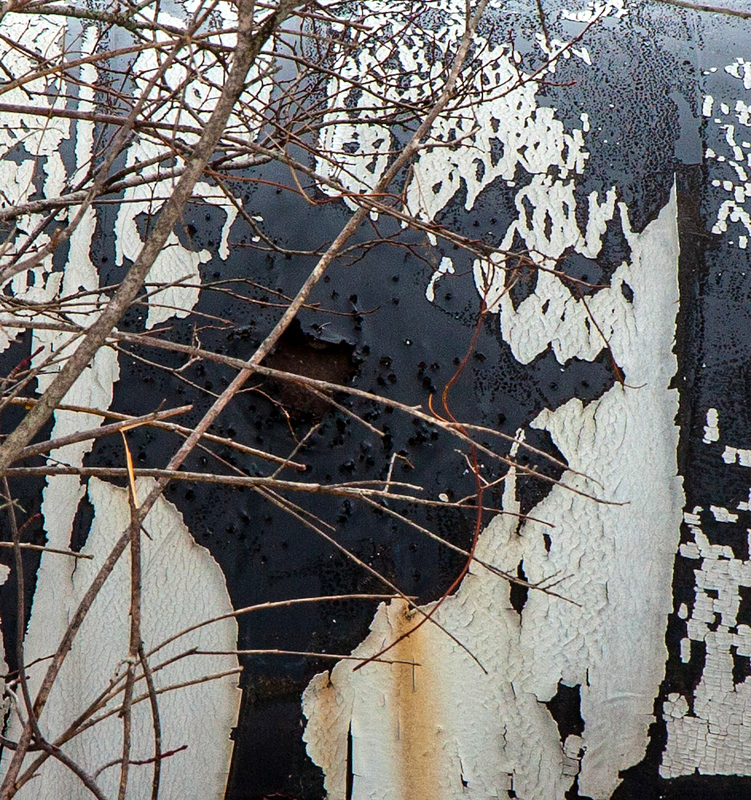 Close-up of the corrosion on the exposed pipeline’s exterior. One aspect of Enbridge’s proposed new Line 3 crude oil pipeline in Minnesota needs more scrutiny: The company’s plan to abandon its old Line 3 pipeline in the ground. Enbridge is a multi-billion dollar company and runs the world’s longest crude oil and liquids transportation system. Surely it can do better. Minnesotans for Pipeline Cleanup recently released a report titled Enbridge’s Mess that highlights the problems around pipeline abandonment. Line 3 would be the first crude oil pipeline abandonment in Minnesota history. What state leaders allow to happen now sets a precedent for all future pipeline abandonment. Further, Enbridge’s plan would shift future clean-up costs to the next generation of Minnesotans. Oil, rust, and dozens of chemicals will remain in the ground beneath farmland, homes, churches, and wild rice lakes; and a little known provision of Minnesota law allows the company to hand liability to landowners five years after ceasing operation of the pipeline …. The state’s Final Environmental Impact Statement on Line 3 says that pipeline abandonment has only two benefits, according to the report. It says abandonment “is less disruptive to the environments in the short term, and it is much cheaper for Enbridge.” In fact, Enbridge would save $1 billion by abandoning the pipeline instead of removing it. The risks of abandonment … are manifold. They include potential economic, environmental, and cultural damages which might not be apparent for years or even decades, but which could cost more than the $1 billion Enbridge would save. The old and failing Line 3 tar sands pipeline runs 282 miles across northern Minnesota. In some areas, such as in the Fond du Lac Reservation, erosion has exposed the once buried pipeline to the elements. The company wants to leave it where it is and build a new and larger pipeline along a new 337 mile route — a route that will cross the Mississippi River’s headwaters and through many wild rice areas. Wild rice is a sacred food to the Anishinaabe (Ojibwe) people. The current pipeline runs through both the White Earth and Fond du Lac reservation. The proposed route for the new Line 3 avoids reservation lands, but still crosses lands where the Anishinaabe retain treaty rights to hunt, fish and gather. Both the new and old Line 3 affect those treaty rights. These tribal nations, as well as Minnesota landowners along the current route, should have a say in whether the pipeline is abandoned or removed. They have not. That needs to change. The Enbridge’s Mess report has received news coverage, including Fox 21 in Duluth and Lakeland PBS. Click here for the full Enbridge’s Mess report.